A one piece Aluminium Modular Ramp ideal for small obstructions. As recognised by the DTLR Accessible Threshold Support Document, even insignificant changes in level with small steps, thresholds, water-bars or kerbs can be exceedingly difficult for wheelchair users and disabled persons. The document defines the need for traditional ramps between one level and another. 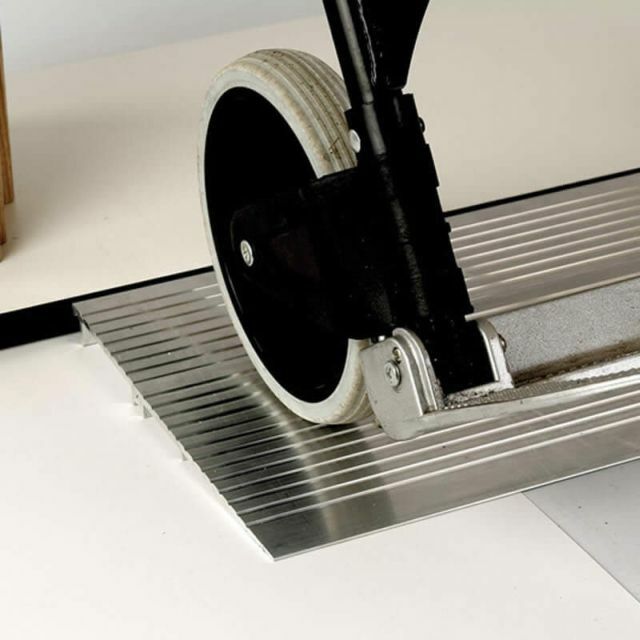 Suitable for wherever thresholds may hinder wheelchair users or other forms of wheeled traffic, the range of aluminium and rubber ramps satisfy virtually all access requirements over low-rise obstructions in new or existing buildings. Ramp 3A - Aluminium shallow ramp plate, 12.7 mm rise.